Researchers have captured footage of bowhead whales rubbing themselves against big boulders to get rid of sloughing skin. 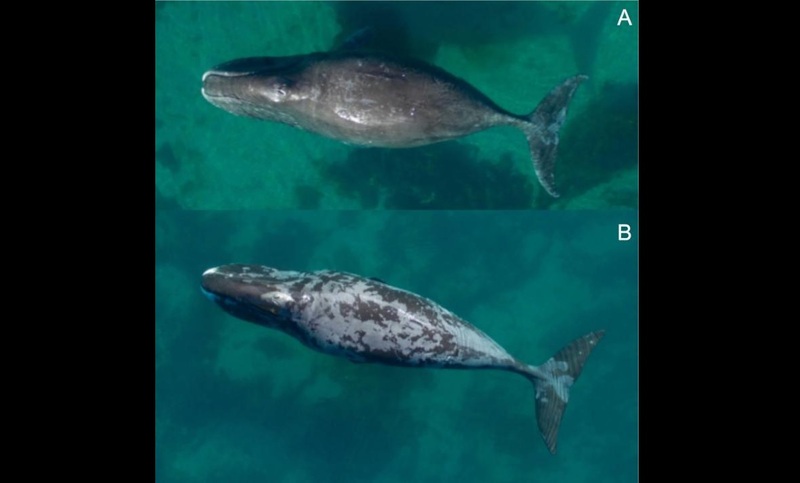 Example of a bowhead whale with nearly no sloughing skin (i.e., proportion of body with sloughing skin = <33%) (A), and another with a high degree of sloughing (>66% of body) and a blotchy skin type (B). In August 2016, a research team from the University of British Columbia, Canada flew a drone over bowhead whales in Cumberland Sound, in the coastal waters in the eastern Canadian Arctic. Their objective was to capture photographic and video footage of the whales shedding their skin. Although most whales, dolphins and porpoises have been known to molt to get rid of dead skin, little is known about this process in bowhead whales. Almost all the bowhead whales were involved in the study had splotchy skin, indicating that they were molting. For forty percent of them, the sloughing skin covered at least two-thirds of their bodies. One of the paper’s authors, PhD candidate Sarah Fortune, described the bay as a “bowhead whale day spa.” The team suggests that the behaviour may help to remove parasites (like whale lice or diatoms) or shed sun-damaged skin.